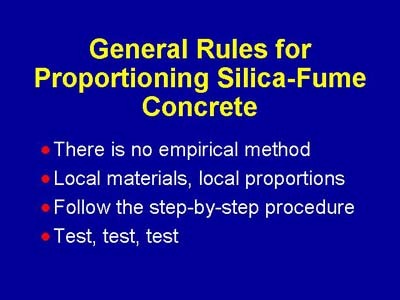 These are the general rules for proportioning silica-fume concrete. It is essentially impossible to predict how all of the variables involved in one of these mixtures will interact. The only acceptable method is to begin with a known mixture and conduct testing using your local materials. After a series of trial mixtures has been made, enough information should be available to make decisions to fine tune your mixture.